The 27th anniversary of the Armenia’s Independence is being celebrated under new circumstances where the popular uprising this past spring has placed the people of Armenia front and center and their aspirations have finally taken center stage as our national priority. For the first time since the movement that led to Armenia’s Independence on September 21, 1991 are the people of Armenia the actual focus of nation-building and the advancement and strengthening of Armenia’s statehood. Those who advanced the imperative of independence more than two and a half decades ago, probably never imagined that the new Armenia that they created would be plundered by its very own leaders, who at the expense of the population stopped at nothing to enrich themselves and recklessly ignored the mass exodus that resulted from their self-centered greed and the national security risks that it posed for Armenia. What we, as a Nation, witnessed this past spring was the people’s will to reclaim what was taken from them and their sheer determination to create a new Armenia where its citizens are not left out and their aspirations are not squandered. The success of this spring’s popular uprising—the Velvet Revolution as its being called—can be attributed to the new generation that was born as Armenia was shedding its Soviet past and embracing a new future. In observing the events of this spring, it was clear that the young generation—the Independence Generation—would no longer allow the country to be ruled by oligarchs and despots, who had sucked the life out of the country and its citizens. The new generation demonstrated that it will reclaim its right to determine for itself the path toward a better future for Armenia. 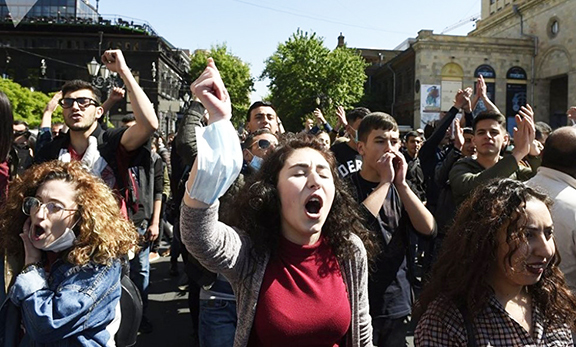 The tectonic shift that took place in Armenia’s socio-political landscape this past spring provided a second chance for the entire Armenian Nation to rally behind the homeland. More important, however, every single Armenian around the world finally became a stakeholder in shaping the future of our homeland, breathing a collective sigh of relief and espousing the hope that radiated from the movement. We, as a Nation, have a unique opportunity, not enjoyed by or afforded to many around the world, to reset our destiny and to work collectively to build a country that is worthy of our national identity, which, above all else, is built on our resilience, innovation and perseverance. These were the tenets that propelled a different generation 100 years ago to rise up against oppression and forge an independent homeland, without which we would not have an Armenia to call home today, and whose legacy and lessons must become building blocks in forging the new Armenia. One of the first requirements in this new paradigm is imperative to rid Armenia of the Soviet yoke that continues to hover over our nation like a dark cloud. Yes, Armenia declared independence on September 21, 1991. However, the society that emerged was created and built of the very same Soviet system that had governed Armenia for the previous 70 years, essentially perpetuating a culture that allowed for the ruling elite to ignore its citizens and fleece them with impunity. If this new landscape is to advance and grow, that system, with all its ugly vestiges, must be forever erased from our country and our society. Therein lies the challenge for the new generation, which must not only broach the future with innovative ideas, but must work to eradicate the Soviet system of government and the societal ills that it has passed down through generations. While we are marking the 27th anniversary of Armenia’s Independence with renewed hope and vigor we must collectively understand that this opportunity—this second chance—must not be squandered and pledge to roll up our sleeves and ensure a more prosperous future for Armenia and the Armenian Nation. Armenia is in a very unique period of her history where the power of people, the essence of democracy, is at work. Congratulations to the Armenians in seeking and gaining their democratic and human rights through peaceful means. I hope that the injustice of the continuing Bolshevik Era policies (carried out by the current Russian government) along with the continuation of Turkish and Azeri genocidal acts can also be stopped and addressed peacefully in a very near future. After centuries of one tragedy after another, our noble nation deserves nothing short of peace and justice, and the restoration of her dignity. God Bless Armenia and the Armenians. As long as Mother Russia hangs over like the Sword of Damocles, nothing will ever change. It may look and smell different, but like a good chocolate fondant,, we’ll never know what’s really inside it. Russian imperial interests will always trample Armenian aspirations. As long as Mother Russia hangs over like the Sword of Damocles, nothing will ever change. It may look and smell different, but just like a good chocolate fondant, we’ll never know what’s really inside of it. Russian imperial interests will always trample Armenian aspirations. We just witnessed the Independence Day celebrations in Yerevan & read this excellent, well written editorial. BRAVO. WELL SAID. All off Turkey and Azerbaijan and Nachevan belongs to Armenia.It is historical and biblical Armenia and Armenian need it back. Also Half of Iran if not all is also Ancient and biblical Armenia and Armenians need it back. Power to Armenia and it’s people.